Step 1 A material product assessment is discussed with customer. Step 2 A specialized shampoo is firstly applied to a section of the leather. This is a safe, no mess no fuss application. Step 3 Gently, the material is cleaned with a Horse Hair Brush by hand to release the soils from the leather. Step 5 Once the leather has been professionally cleaned, a conditioning cream/ protective coating is applied with a micro fibre cloth to re-hydrate it, giving your lounge back its soft comfortable feel that will also retain the moisture, helping to prevent the leather from becoming brittle and cracking, further enhancing its appearance. We provide specialised leather cleaning for your Home, Business, Car, Boat or Caravan. We offer a complete onsite service done by hand using only the best quality cleaning products and materials. We use no machinery or chemicals which will damage or discolour your leather furniture. 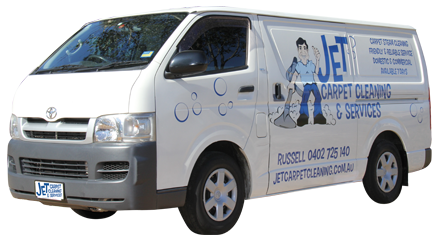 Jet Carpet Cleaning and Services have a range of cleaning packages to suit your needs and budget. Our professional cleaning service operates out of Penrith and we service Greater Western Sydney including Jordan Springs and the Blue Mountains.